CES 2017 kicks off in Las Vegas this week, and a handful of USB-C displays compatible with the new MacBook Pro will be unveiled at the show. USB-C displays display up to 4K video, transfer data, and charge the new MacBook Pro over a single cable connected between the display and notebook. 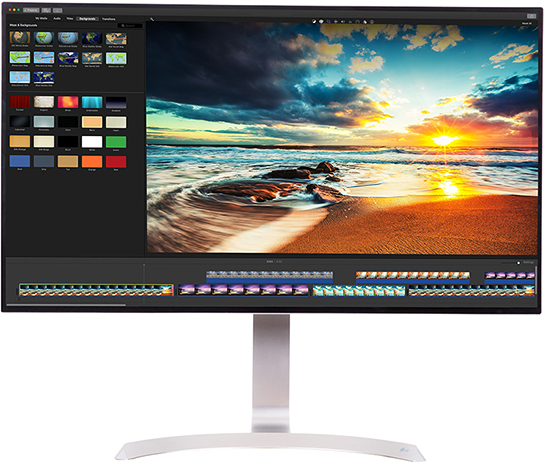 Dell today introduced the S2718D Ultrathin Monitor, a 27-inch IPS display which it claims is the "world"s overall thinnest monitor" with HDR10 support for vibrant colors. 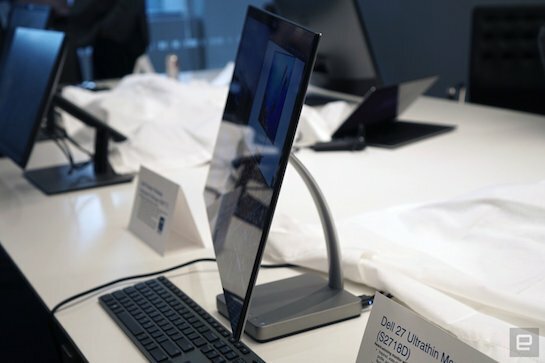 The display has a glossy finish with Dell's ultra-thin InfinityEdge bezels, but its base is bulkier than average to accommodate for the internal components. While the display is indeed very thin, its other specs fall short of some existing USB-C and Thunderbolt 3 displays on the market. It is not 4K, for instance, but rather Quad HD with a resolution of 2,560×1,440 for 108 PPI. And while it covers over 99% of the sRGB color gamut, it does not support the wider DCI-P3 color gamut. The display has a 60Hz refresh rate, peak brightness of 400 nits, 1000:1 contrast ratio, 6ms response time, and 178⁰ wide viewing angle, per Tom's Hardware. It can connect to a new MacBook Pro or 12-inch MacBook over a single cable, but with only 45W of power delivery. There is also one HDMI 2.0 port and an audio line out. The S2718D Ultrathin Monitor will start at a rather expensive $700 on Dell.com, with U.S. availability expected on March 23. LG will be showcasing more attractive options at CES this week, including the 32UD99, a new 32-inch IPS display with HDR10 support and 4K Ultra HD resolution of 3,840×2,160 for 137 PPI. In addition to HDR, the 32UD99 covers over 95% of the DCI-P3 color gamut for wider and more immersive colors. The 32UD99 can connect to the new MacBook Pro or 12-inch MacBook over a single cable, but LG did not specify the wattage for pass-through charging. The display also features built-in speakers with "Rich Bass" technology and a "True Color Pro" setting for "color reproduction accuracy unmatched in the industry," according to LG. While it does not have USB-C input, LG will also be showcasing the 34-inch 21:9 UltraWide Mobile+ Monitor at CES 2017. The new 34UM79M model is "the world's first Chromecast-enabled multimedia monitor," enabling users to stream movies, music, games, and more from mobile devices directly to the monitor. Also on display in Las Vegas alongside LG's UltraFine 4K and 5K displays will be its new 34-inch 21:9 UltraWide gaming monitor. The 34UC99 model is equipped with AMD's FreeSync technology, 1ms Motion Blur Reduction, Dynamic Action Sync, Black Stabilizer, and other gamer-friendly features. No word yet on USB-C input. LG did not confirm pricing or availability, but those details should become known once CES gets underway later this week. Dell's and LG's new USB-C displays provide new MacBook Pro owners with a couple of additional choices after Apple discontinued its Thunderbolt Display. LG's UltraFine 5K Display remains one of the best options, but those looking for alternatives should read our USB-C and Thunderbolt 3 Display Buyer's Guide. You know, I just miss Apple displays already. None of these have the aesthetics the ACD and TB's I still own. That Dell monitor is gorgeous. Apple should be ashamed of itself. Gorgeous? It's a 1440p display for chrissakes. If anyone should be "ashamed" here, it's Dell for shipping 8 year old technology in 2017! Could you please explain what you were meaning, why would a low or high resolution be ok for a 27" monitor but a high resolution only be good for a small screen? Resolution is all about how far you sit from a screen. What I meant is simply that Mac OS is designed to look best at about 100-110 pixels-per-inch or at twice that much 200-220 ppi, in 'retina' mode, with perfect pixel doubling. This translates to an 'ideal' resolution of either 1080p (or 4K for retina) for a monitor in the 22" range or else a resolution of 1440p (or 5K for retina). This is the "correct" mode of displaying MacOS, but of course, as you say, one could just sit closer or further from the display. That's a different topic, Apple designs based on what it understands to be typical usage. As you can see from this chart, a 4K 27" monitor is "wrong", because OS elements appear too small if used natively as 4K, and too large if used as "retina" 1080p (which is what the OS defaults to, by the way). Many people will go into the settings and run a 27" 4K monitor scaled to 1440p because, as most people would tell you, that just "looks" like the right size for Mac OS on a panel that size. But if you do that you are wasting money: you should have just bought a 1440p monitor instead of a 4K. This is also why Apple never released an iMac 27" 4K, but waited until they could release a 5K 27" iMac, and a 4K 21.5" iMac. Ditto for the LG UltraFine. You will never see Apple officially endorsing a 4K 27" panel because its OS just looks bad on it. This link ('https://bjango.com/articles/macexternaldisplays/') is very helpful, and it contains this great chart, which I think every one shopping for an external display should take note of, and that MacRumors staff should understand before they claim that higher resolution is always better. I have become convinced that this is an industry problem: they find it easy to manufacture 27" 4K panels right now, so this is what they are pushing. But for Mac users, 22" 4K or 27" 5K are more appropriate. I personally don't have very strong eyesight (almost wrote iSight there), so maybe I would be content with a 24" 4K and things looking a bit big. But I had a 27" 4K and had to send it back, the OS elements were so big as to be goofy. Way better looking than the Apple/LG monitor but still not as appealing as previous Apple monitors. Nothing wrong with it, if you were buying a display in 2008. In 2017 - if I am going to buy a display, I expect it to be 5K, or 4K at the very least. 108ppi is a joke. Never understood disgusting random/round feet below a rectangular screen. Are these designers blind? You're assuming they have designers.